The concept of noise is universal. People everywhere complain about it and think it’s unpleasant. However, how we perceive it is a matter of cultural awareness and the decibel level that converts it into nuisance depends on the country we are from. In Spain, this level is pretty high and Spaniards put up with background noise more easily than people from northern Europe. Whether they’re aware of it or not, they aren’t and don’t even try to be silent. They shout at home as naturally as they hoot their horn in the street. Besides, most public premises are very poorly soundproofed. I remember a Spanish friend entering a restaurant in France, who was astonished to hear the sound of rattling cutlery. In Spanish cafés, you can hardly hear what the person next to you is really saying. Actually, it’s surprising to see how easily Spaniards communicate through the noise of their conversation. In northern countries, when a group of people meet, it’s normal for each individual to speak in turn, and for the listeners to wait before giving their opinion; whereas here, in Spain, if you want to be heard, you have to raise your voice, interrupt the audience and very likely scream in the ear of your interlocutor to be sure they listen to you. Coming from the Latin tradition, Spaniards love to argue. They enjoy gatherings where they can speak their mind and compare their opinions. But do they ever reach an agreement? When I go to a meeting at work or watch a chat show on Spanish television, I can’t help thinking that these unending conversations are pointless. Rather than an exchange of ideas, they look like exhausting fights that never come to anything. 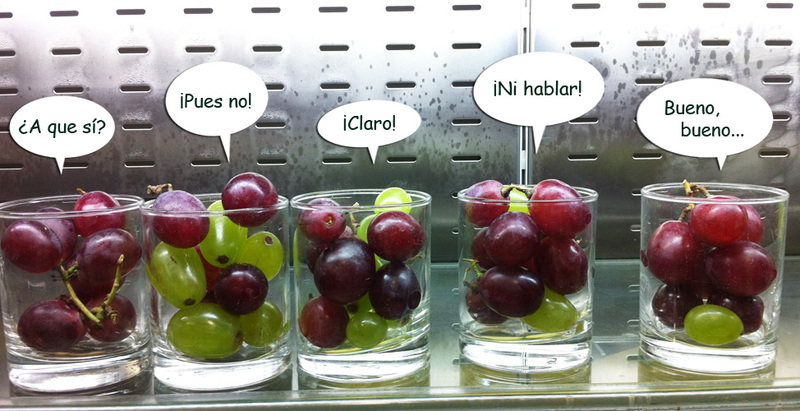 Don’t the Germans say that when three Spaniards discuss a problem together, they end up with four different opinions? A custom I particularly enjoy in Spain is the New Year’s Eve celebration. Just before midnight, during the countdown to the New Year, it’s traditional to swallow twelve grapes, one on each chime of the clock, which you can hear from Madrid’s town hall. The event is broadcast on all TV channels. For the New Year to be lucky, you must have swallowed all the grapes before the twelfth stroke. The process isn’t as easy as it seems, especially if the grapes are big. You have to put one grape at a time in your mouth, chew it and quickly swallow it before the following stroke, being careful not to choke. I love this tradition because it’s perhaps the only time of the year when I can enjoy Spanish company in silence.